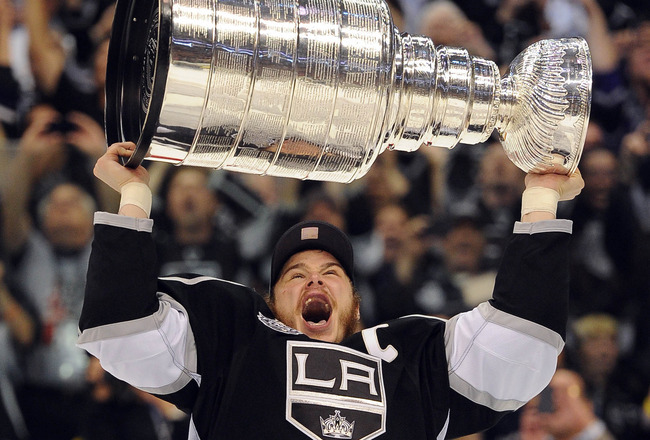 There you have it: The Los Angeles Kings are Stanley Cup Champions. This is the stuff that’s only written in fairy tales. An eighth-seeded team, with enough heart and determination, knocking off the top 3 seeds in the Western Conference, and taking the last game of the Stanley Cup Finals in a dramatic and dominant fashion. I can’t even begin to say how happy I am for the LA Kings and their fans, but first we have to acknowledge their opponents: the New Jersey Devils. They fought back in an amazing way, coming back from a 3-0 game deficit in the SCFs and gave the Kings a legitimate run for their money. Honestly, if the Kings hadn’t played the Game 6 that is now etched in the record books, the Devils could have easily taken the series. The great part about all of the praise for both organizations is that it shows the class of hockey players, officials, and executives. The exchange between Martin Brodeur and Jonathan Quick, in particular, was great to see, because they have such a mutual respect for each other. At one point, I could read Brodeur’s lips and he told Quick that he was “incredible”. I mean, seriously? That’s a unbelievable compliment coming from a future Hall of Famer like Brodeur, and obviously well-deserved. Was anyone surprised? If Quick hadn’t gotten the Conn Smythe, I think a riot would have broken out in the streets of Los Angeles, Vancouver-style. No? Too soon? Meh, whatever. But back to the point, Quick’s performance was unreal. Completely dominant from start to finish, and he never missed a beat. 16 wins, 4 losses. Only one road loss. A .946 save percentage. WHAT THE WHAT?! He’s amazing. Can’t even handle it. So deserving, and he’s got a long career ahead of him. It’s really almost funny at this point. The picture says it all. When both Richie and Carter were traded away to markets that, let’s be honest, weren’t the most desirable for them as players, you had to wonder if they’d ever see the success they deserved. And now look: Carter was traded at the deadline from Columbus, the bottom of the NHL food-chain, to the Kings, and reunited with former-Flyer Richards. It’s a cinderella story if you’ve ever heard one. Frazzle Dazzle, I’m so proud of you. As a former Chicago Blackhawk and member of the 2010 Championship team, I always root for those players. Kings fans, keep this in mind: you can and always should root for the players that are important to you, no matter where they’re playing. It keeps historic moments like this fresh in your mind, and you’ll never get over it. Fraser was a key 4th line role player on the Kings this season, and was on the ice when the hole blew to end Game 6. 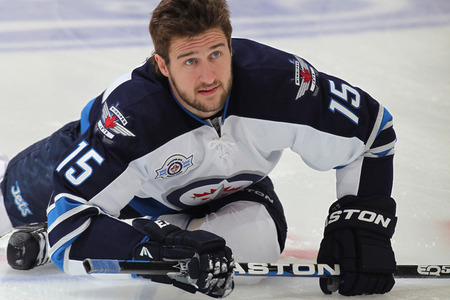 He’s a classy guy, a classy player, but was the ugly duckling of hockey this season. No one wanted him. The Oilers and the Kings went back and forth trying to figure something out for him, and thanks to the Kings organization and coaching staff, Fraz has carved out a nice spot for himself in LA. Let’s hope he sticks around, because he deserves it. Plus, he’s the first of the 2010 Blackhawks to win the Stanley Cup again. Git ‘er done, Frazzle Dazzle! Holy schnikes, talk about a 180 degree turn. 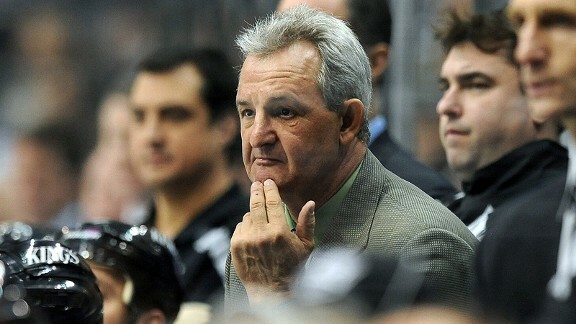 Darryl Sutter, HUGE ups to you, sir. To take an organization and a team that was completely discombobulated (I must’ve swallowed a dictionary, that word is longgggg) and dysfunctional, to getting them into the playoffs, and winning the Stanley Cup as an eighth-seed is incredible. And to think he did it without ever cracking a smile. It’s moments like this that make me love hockey. I just fell in love more and more with the sport, watching history happen, and seeing the relief on the players’ and coaches faces to have achieved the most difficult trophy to win in all of sports. It’s incredible. Honestly, I could go on and on about Game 6, the hit on Rob Scuderi, and every “what if” moment imaginable. But I just want to say one thing to the Kings fans: ENJOY THIS. It’s history that you just witnessed, and something that will forever go down as the night that cheers erupted from the Staples Center without Kobe Bryant on the court. I hope LA becomes more of a hockey town, because this organization deserves it. It says a lot about the resilience of the players and the front office to continue to play and work for an organization that might not have the greatest presence in its location. So cheers to you, boys, you deserve it. Now party like you’re Patrick Kane, but try not to get arrested or let the front office get mad at you. So basically…..party like it’s 1999. …then you’re either crazy, a liar, or both. It’s going to be a special thing to see Los Angeles win, but then, there’s the other guy. The Devils, though not as much my favorite as the Kings are, they deserve to be here. How they dethroned King Henrik and the New York Rangers, coming back from 2 games down in the Eastern Conference Finals will be the stuff of legend. Every game was a classic in that series, and they worked hard to get to the Finals. No Doubt. Now, I’m not going to make any predictions for this series. 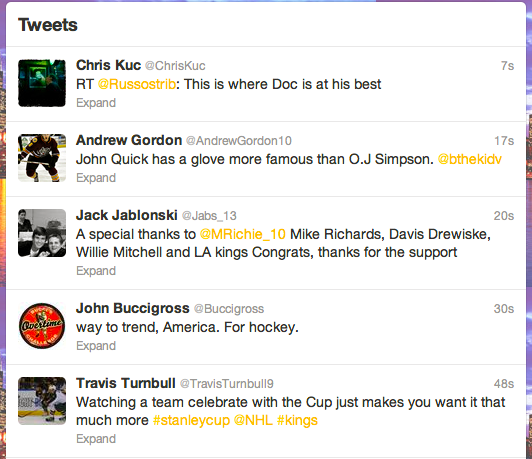 But, if I’m honest (which, lezbehonest, I always am), I want the Kings to win for a few reasons. One, Colin Fraser is on that team, and I always root for former Blackhawks. They’re coached by Darryl Sutter, another former Hawk. And, finally, probably my most legitimate reason, I want Mike Richards and Jeff Carter to succeed. As much as I despise the Flyers, and they are the former captain and alternate captain of that team, what happened to them last summer was brutal. They were the faces of that franchise, and were blindly traded away. Carter struggled quite a bit this season with injury, and it’d be nice for him to get some vindication.